A large coastal Northland dairy farm, offering scale and good infrastructure, is for sale by auction. 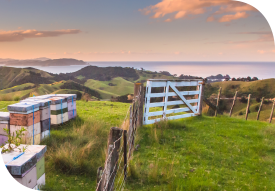 Megan Browning of PGG Wrightson Real Estate, Dargaville is bringing the 314 hectare property, situated 12 kilometres west of Dargaville, to the market. She says the free-draining soil, easy rolling contour and beach location make the farm an outstanding prospect for a new owner. “This is a large-scale farm that ticks all the boxes. Its current owners are retiring, leaving the property in good heart and well set up for the future. “Presently running 650 cows on split calving, over the past four seasons, the farm has averaged 242,500 kilograms of milksolids. A winter milking contract provides lucrative bonus income. “Proximity to the beach, which is accessible directly from the property, is another attraction, offering fishing and leisure opportunities from the back door,” she said. Focus of the farming operation is the 41-a-side herringbone cowshed. Recent improvements include a new computer, molasses silo, vat refrigeration unit and hot water cylinder. A 300 cow feed-pad sits alongside the shed. On the local Mahuta Water Scheme, the current owners hold 700 of this scheme’s 1600 shares. Young stock are grazed off the property, while all cows are wintered on. Supplements grown on have included green feed maize, maize silage and chicory. An electric travelling irrigator, which the current owners use to spray most of the sandy soil, will stay with the farm. Four dwellings on the farm comprise a four-bedroom fibre cement house, a three-bedroom weatherboard house and two one-bedroom units. With a September 2014 government valuation of $5.805 million, the farm will go to auction at 11am on 14 October at PGG Wrightson’s offices in Whangarei.